Thinly dice shrimp and place in a large mixing bowl. Add orange, lime juice and refrigerate for 30 minutes. The shrimp will "cook" in the citrus juices. In another mixing bowl, mix the remaining 1/2 cup lime juice with cucumbers, bell peppers, cilantro, green onions and jalapeno; mix to incorporate evenly. Add the vegetables into the shrimp bowl and mix well to incorporate. Season with salt. If you’re worried about serving raw shrimp; pre-cook shrimp as follows: Bring a medium pot of generously salted water to a boil. Add shrimp and cook until pink and cooked through, 1 to 2 minutes. Summer is in full swing; days spent relaxing by the pool, playing with the kids at the park or hosting fun summer parties. When hosting a summer fiesta, I like to serve a tray of cold appetizers, because no one really likes to crank up the stove on a hot summer day. This is why I like to serve ceviche: shrimp soaked in citrus juice until tenderly cooked topped off with crisp vegetables and a bit of jalapeño for heat. 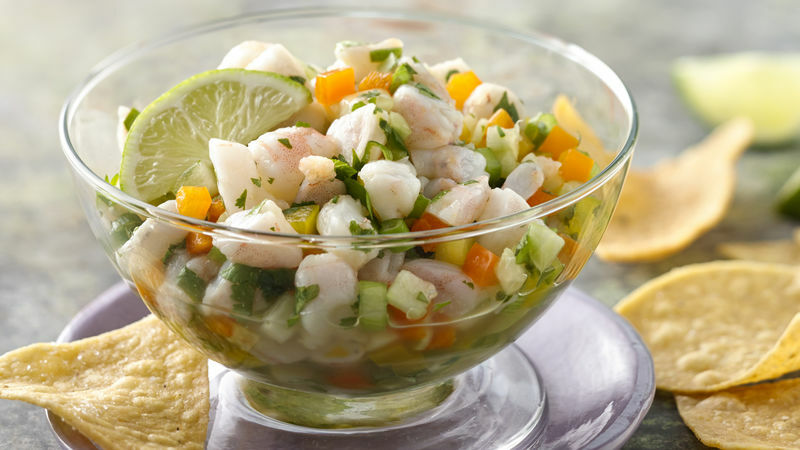 Tuck your serving glasses in the fridge until ready to serve to keep your ceviche nice and cold for your guests. Along with a few tortilla chips and a cold beer, your fiesta is sure to be a hit.